Autumn is not over in Middle Tennessee. November often brings us the best October weather. The skies may not be a brilliant blue or the trees as colorful~but, the sweetness of a mid 60 degree day cannot be denied. There's a golden glow in the garden as the sun rises each morning. It takes a while for it to get over the tree tops and reach the front garden, but, it's worth the cool wait to see the bumbles wake up and to listen to the birds. The center bed is starting to look exactly as I hoped it would. Very much like the understory woodlands that are adjacent to a cedar glade. Finally, hypericums, River Oats, native grasses and wildflowers have filled the bed to overflowing. It's glowing golden. I love the native grasses and can't sing their praises louder. Little Bluestem is not flopping! Here are a few flowering plants that are still making me smile. Yes, it can! It's Garden Bloggers' Bloom Day brought to you by the talented Carol of May Dreams Gardens. To celebrate the day please follow the link (here dears) to see more beautiful gardens then you can imagine touring in one day! Salvia, Lady In Red, Pineapple Sage, Coral Nymph, etc. Autumn is not over here as well, in fact as far as foliage goes we are at peak. I love the look of your caringly tended woodland. Happy GBBD! The golden glow is over here so I am glad to see yours in full glory. I do love those warm fall days. We had one on Saturday and ate lunch on the patio. The oak leaves rained down upon us. Love your glade with its natural beauty. I know you have worked hard to achieve that not so effortless look. It works well and your bench beckons. Wow Gail - still lots of bloom in your garden. Everything looks beautiful. Love the grasses. 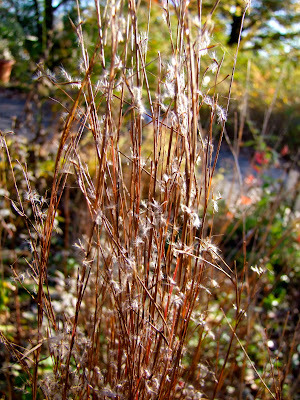 I was really smitten by switch grass this year, and am tempted to see what it would do in a sunnier part of our garden. Gosh Gail, you garden rocks! The center bed is indeed looking mighty nice. I'm glad you're getting a nice autumn -- you deserve it after this spring and summer! I love the golden glow of your center bed. How beautiful your garden is. My Fairy does have just a tiny blossom or two. I have never, ever seen S. novae-angliae foliage look like that. Mine always gets mildewed and shrivels away. I'm not familiar with S. praelatum. It looks a lovely thing. Must investigate it. Beautiful, Gail, and so much still in bloom! I agree the golden glow of autumn is lovely, and so much kinder than the blazing sun of summer. And you still have bees! Very pretty blooms and I really like the back lighting. So much color. So much beauty Carol! I love your Center bed, it really does look natural. Nice to know that there are still flowers blooming somewhere, my garden is definitly winding down for the winter. Splendid color for mid November. I love the River Oats.. I don't think I could take your heat in summer, but right about now I wish I was enjoying fall all over again. You make it look very attractive! So pretty. Very golden indeed. The lower angle of the sun in autumn does such nice favors for the new colors in the garden. Wow! you're an accomplished photographer and blogger. What an honour to get to know you. How do you get your insects to stay put and pose for you?! And I think you'll be a fun gal to celebrate every day with. It's gorgeous at C&L right now Gail! I love the photo of your screened in porch. That pop of red is so pretty. Our fall is over too so it's nice to see some blooms and color somewhere! Lots of lovely color left in your garden. And I had to smile because you call them "River Oats" and up here we call them "Northern" Sea Oats. We love to get that geographical link into those names. It is good to see you still have some good color going on there. We are getting snow today! I like how you always have bees on everything. Lots still happening in your garden. The pic of the wallflower brought me back to my grandmother's garden in Wales -- I can almost smell it now. Happy blooms day, Gail! We have much of the same plant material in the woodlands. I am amazed at all the Bluestems growing along the roadside. Love the picture of the sun shining through your oak tree. I'm with Kathy: I don't actually want to live in Tennessee--except now! My Montana garden plots are half-covered with snow, and we're under a "severe weather alert," with a storm moving in that's expected to drop five to seven inches of snow here, and up to twenty in the mountains above us. 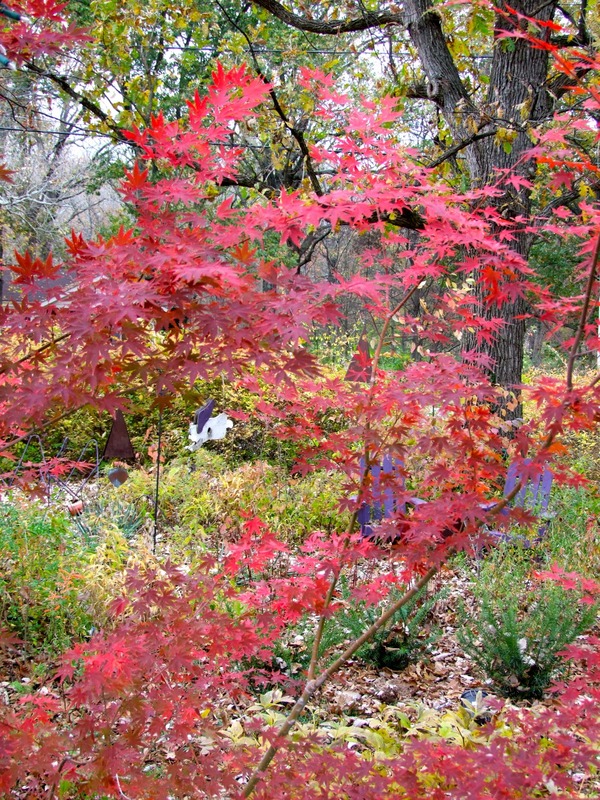 What a contrast to your colorful garden! Gail, I love the wooded area. It looks so natural. You have planted well and carefully. So much colour.....wonderful in an autumn garden. Plenty of blooms for the bees. You are so fortunate to still have them visit.Have a good week. You are lucky to have a few blooms now Gail. I have only a mum bloomng. I do have some color due to a few leaves left on some shrubs. Happy GBBD. I'm very glad things are turning out just the way you want them to ! Those last bits of warm keep me content. I had to scrape my windshield today but it warmed to sit by the lake and chat over coffe for a few hours with a friend.Really like the orange blossoms.Thanks for the great share. Hi Gail. 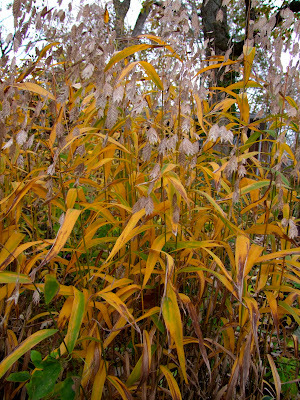 You still have so many golden Fall leaves and grasses in your garden yet. The Orange Citrona is so lovely and I got to get a Fairy rose. LOL! They just bloom and bloom don't they? Have a wonderful wek! 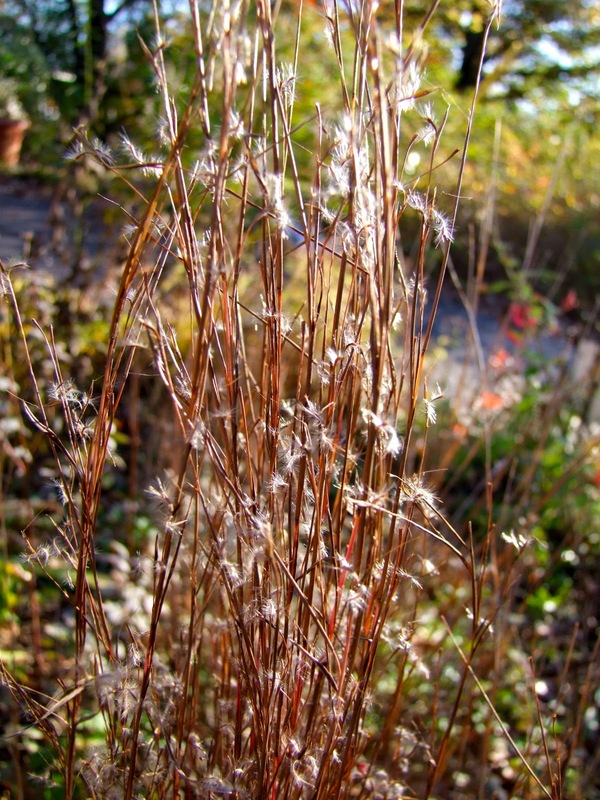 Great post...I'm so jealous of your Bluestem...mine are floppy every single year! Lovely! And I'm so impressed that you;ve switched over to whatever-it-is they call asters now! Beautiful autumn you're having! The center woodland bed is just breathtaking. Oh, how I long to visit C&L in person ... but I might not want to leave! Gail, don't you just love those fall days, with the sun shining? The colors of autumn look fabulous in the bright light. You get a pretty long run with your Asters. Ours are mostly faded now, but none of ours were as delicate and elegant looking as your Symphyotrichum oblongifolium. It looks like an exploding firework....just beautiful! Autumn looks beautiful there...I especially like the grasses! I always enjoy the view of that blue bench in the garden. It just looks perfect there. Gail the autumnal hues at Clay and Limestone are so beautiful just now complimenting those blooms. The light in your photos throughout looks so radiant. Great post - you have a lot going on in your garden still! Love the Hamamelis especially. Makes me want to go out for a walk in the fall color at my house right now! Gail, I was commenting on the golden glow this morning... although the air has a chill, the garden offers us such warmth in color. Here is hoping you are enjoying the fall. I love all your bench photos, in every post I've seen them they're great. 60 degrees does sound very sweet - we're done with that weather for 6 months or so. But that's OK, good thing I get a gardening break around the holidays or I'd go nuts.